On what’s normally a vacation week, four local high school students were hard at work organizing Town Hall for our Lives meetings around the area. The meetings, inspired by the Parkland student movement, are opportunities for students to talk to their elected officials about gun control and gun violence. 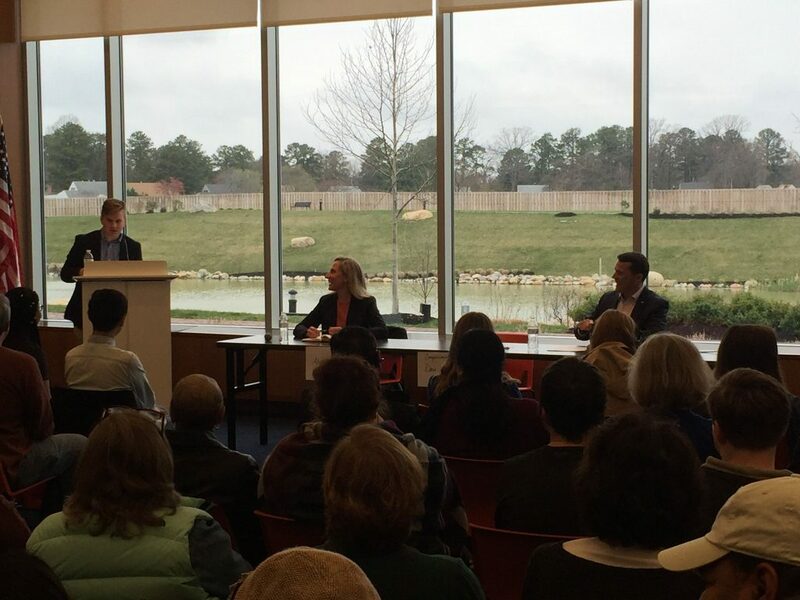 Chaz Nuttycombe, a senior at Hanover High School, put together the most recent event this past Saturday at Libbie Mill Library in Henrico, part of Congressman Dave Brat’s 7th Congressional District. He invited Brat, but the congressman declined to attend via an email sent to one of Nuttycombe’s co-organizers. “It looked like a form email,” he said, describing the email as one that characterized past town halls as rude and disrespectful. After Brat declined, Nuttycombe invited the Democratic challengers, former CIA operative Abigail Spanberger and 25-year Marine veteran Dan Ward. “That’s the etiquette. You invite your representative and if they decline you invite the competition,” he said. Both accepted his invitation, joining the 80 or so people in attendance. He characterized Brat’s tenure in office as symptomatic of what he called a bigger problem; representatives who worry more about re-election than about serving constituents. “Everyone is taking the political temperature on issues that are clearly right or wrong, and we need people of courage to take the moral positions,” he said. Spanberger said the problem was bigger than this meeting, but thought the absence was especially notable. “Of all the events that he hasn’t attended and all of the times he hasn’t made himself available, I think this one was particularly disappointing,” she said, noting that Brat hasn’t held a town hall since last spring. While school safety was the focus, Nuttycombe also asked the candidates to sign a pledge to hold at least four town hall meetings a year. Both signed. Also in attendance was Del. Schuyler VanValkenburg, a high school teacher first elected to represent the 72nd district this past November. “I think it’s important to show them support, and I agree with their cause,” he said about attending the meeting. He said the meeting was important, but stressed that elected officials need to also work to address the more common incidents of gun violence across the nation instead of just the tragic outliers. RVA Mag tried to reach the congressman to ask him about his absence. As with the last time we reached out to his office, we received no answers to our specific questions, however, his communications director Mitchell Hailstone only provided what he called ‘background’ on Brat. The short response described him as a loving father who is concerned about school violence, and noted that he held “a roundtable discussion with school security officers, mental health experts, superintendents of schools, law enforcement officials and school board members,” which he noted was not covered in RVA Mag but in the Culpeper Star Exponent. Despite the lack of support from the district congressman, Nuttycombe is moving forward with his work. 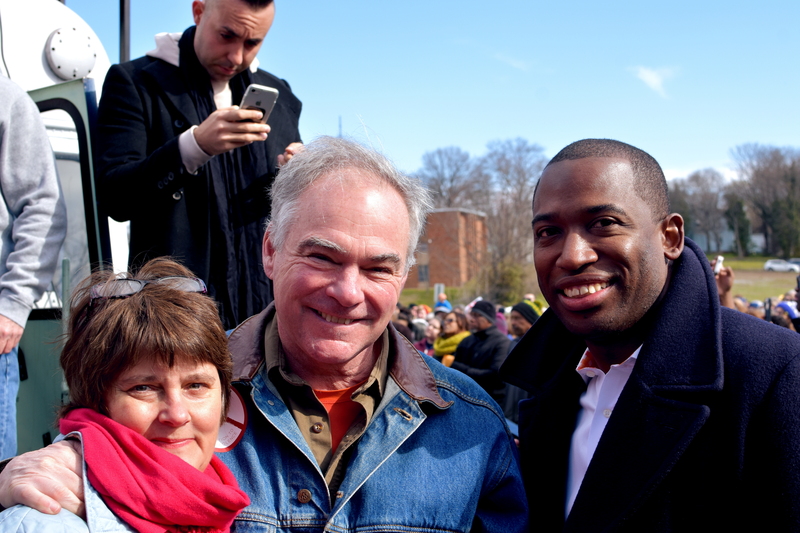 His next step is a town hall with Rep. Donald McEachin and Sen. Tim Kaine on Apr 21 at the Adult Alternative Program, an ex-offender re-entry program in Richmond, and a major rally the day before on Brown’s Island connected to the national walkout starting at 12 AM. The rally will take place at noon with music, speeches, and a march to the State Capitol where Gov. Ralph Northam will speak following student leaders speeches from the steps of the state building. 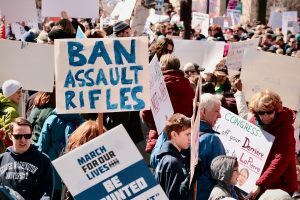 The issue of gun control in the wake of the Parkland Shooting at Marjory Stoneman Douglas High School, which left 17 people dead and an equal number wounded, has re-ignited the national debate. 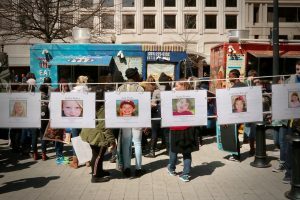 Led by the student survivors, the issue has gained national prominence through a series of high profile media appearances all of which culminated in the March for Our Lives rally on March 24 that brought close to a million people to Washington DC. 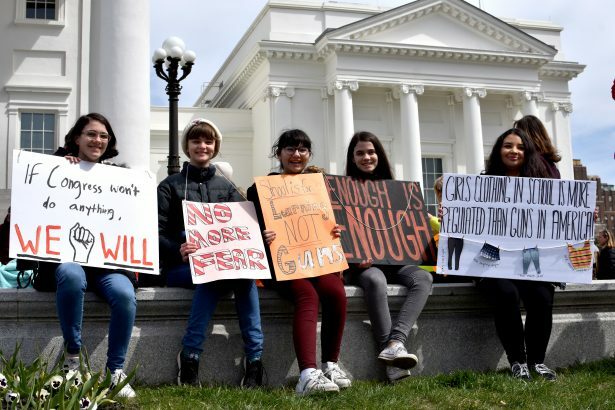 Nonetheless, the VB teen said he was encouraged and received positive feedback from his classmates who thought he was brave to share his contrarian opinion during the walk-out supporting stricter gun control. Jackson, struck a conciliatory tone in his interview inviting people from all sides of the debate to his rally, saying, “I want to invite all the viewers to come along and show your support and really view a different point of the aisle if you are in support of gun control. This past Saturday, youth led marches to demand an end to gun violence in all 50 states. 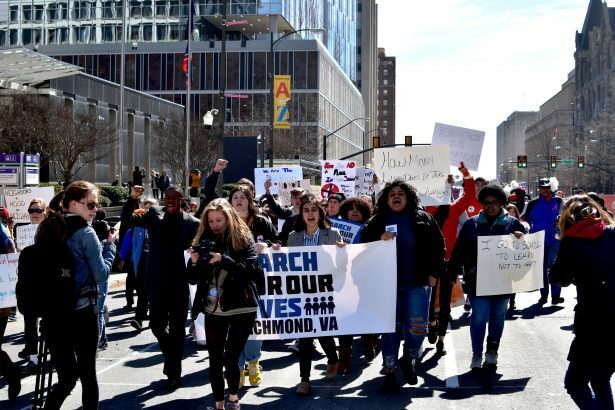 RVA Mag had teams in Washington D.C. for the national event, and another at home in the River City, where students from local high schools led more than 1,500 from Martin Luther King, Jr. Middle School over the Leigh Street Bridge to the steps of the Virginia State Capitol. Youth from the Armstrong Leadership Program kicked off the Richmond event and shared the stage with invited speakers like Superintendent Jason Kamras, Mayor Levar Stoney, and Sen. Tim Kaine. 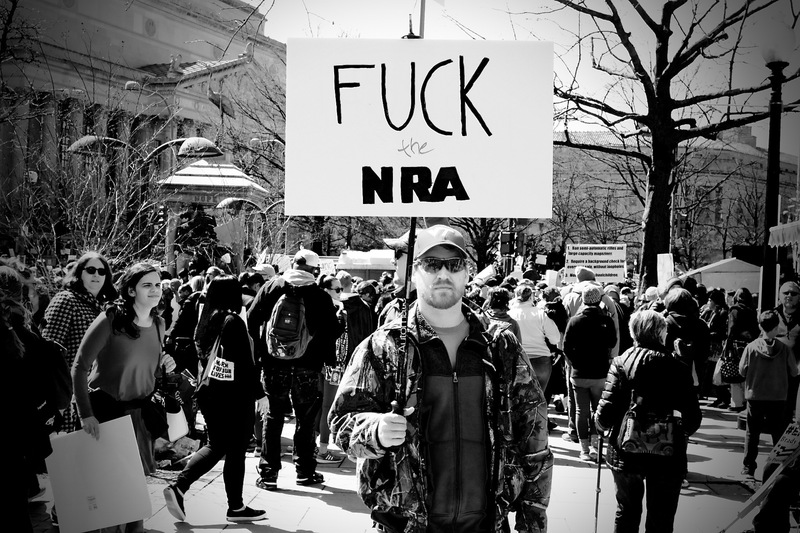 Up in Washington D.C., over 500,000 gathered for a rally on Pennsylvania Avenue, blocks from the Capitol, to represent the national movement and urge lawmakers to pass legislation banning both the sales of weapons used in mass shootings along with high-capacity magazines, and to close loopholes in America’s background check system. 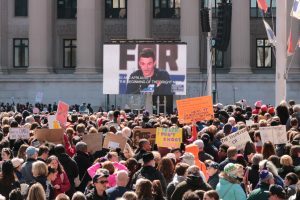 Over 500,000 people braved the crowds in Washington DC today to attend the March for Our Lives rally planned by student survivors of the shooting at Marjory Stoneman Douglas High School in Parkland Florida on February 14. The shooting, which left 17 of their classmates dead, has promoted student activists like Emma Gonzalez and David Hogg to national prominence as leaders of the Never Again and Enough is Enough movements. 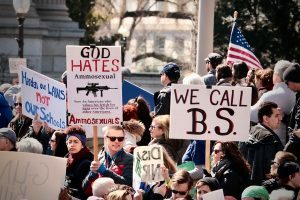 The rally today, five weeks after the shooting in Parkland, was organized chaos of the best kind. People from all over the nation flooded the streets, holding signs, chanting, and listening to the stories of survivors of gun violence. Tension mounted throughout the tragic stories until the first Parkland survivor took the stage. “If you think today is good just wait for tomorrow — the future looks very bright,” Cameron Kasky said to a transfixed audience. Not long after, a hush fell over the crowd as a video of the harrowing news reporting from February 14 was played for the crowd. After Kasky spoke, the rapper Common came out and performed a song for the audience. While there was a celebrity contingent in attendance, including Miley Cyrus, Ariana Grande, Jennifer Hudson, and others, one of the speakers was quick to remind the crowd that this was “not Coachella”. Registering voters also played a critical role in the rally today with volunteers swarming the streets and metro stations encouraging people to “vote them out” in the upcoming midterm elections. 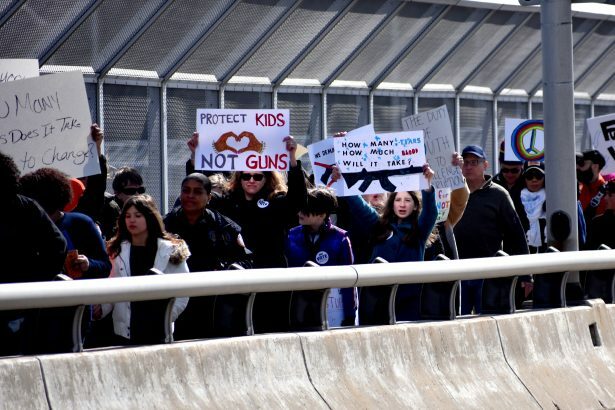 Peninsula Voices for Change (PVC), a Hampton Roads non-profit traveled via bus with members, allies, and affiliates to show support, not only for the victims of gun violence, but to raise awareness. While there were many intersections present at the rally, there was an admirable presence at the event different from the other massive demonstrations since November 2016: Young people. 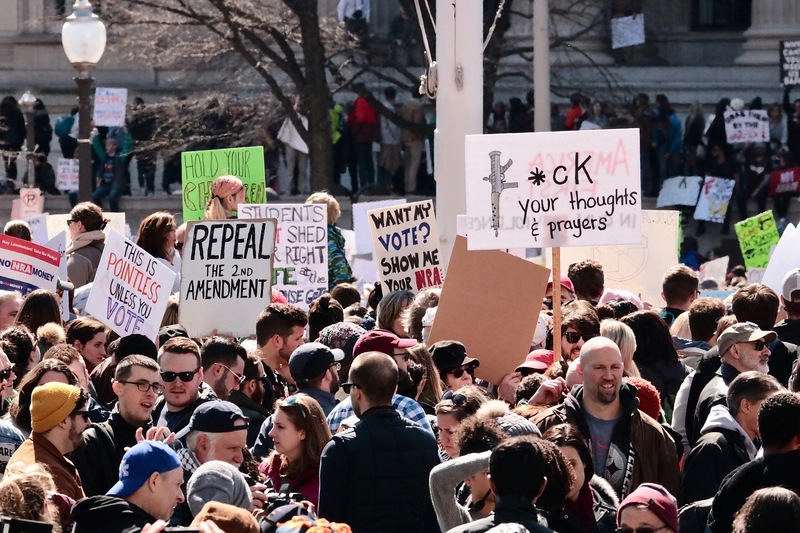 They are who will be voting for the next generation of lawmakers and having current lawmakers see the vast numbers of people who came out today has the ability to directly affect policy. Eight school shootings and 29 mass casualty attacks have occurred in 2018 alone, with the latest tragedy at Florida’s Marjory Stoneman Douglas High School, leaving 17 teachers and kids dead and another 15 injured. 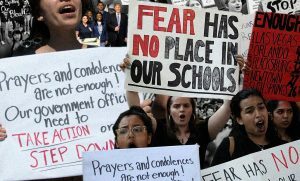 Fed up with Congress’ lack of action on gun control legislation and fearful for their children and students; teachers, parents, and communities around the country are demanding their voices be heard with a campaign to walk out of schools on March 14. 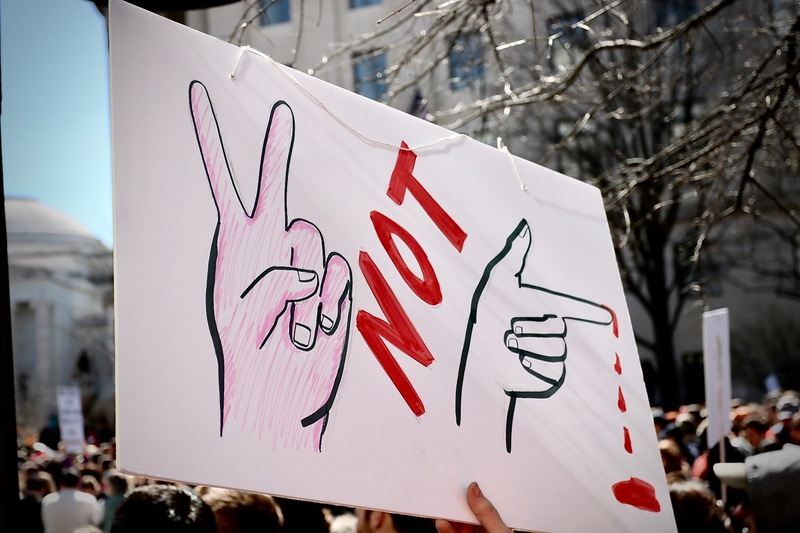 Women’s March Youth EMPOWER, a sub-group of the Women’s March organization, is calling for teachers, students, school administrators, and allies to take part in their country-wide #NationalSchoolWalkout campaign at 10 am across every time zone to send Congress a message on gun violence that children and students need more than “thoughts and prayers.” We need Congress to take action to pass gun reform. The walkout will last for 17 minutes, one for each victim who lost their lives in the Broward County, Florida school shooting. 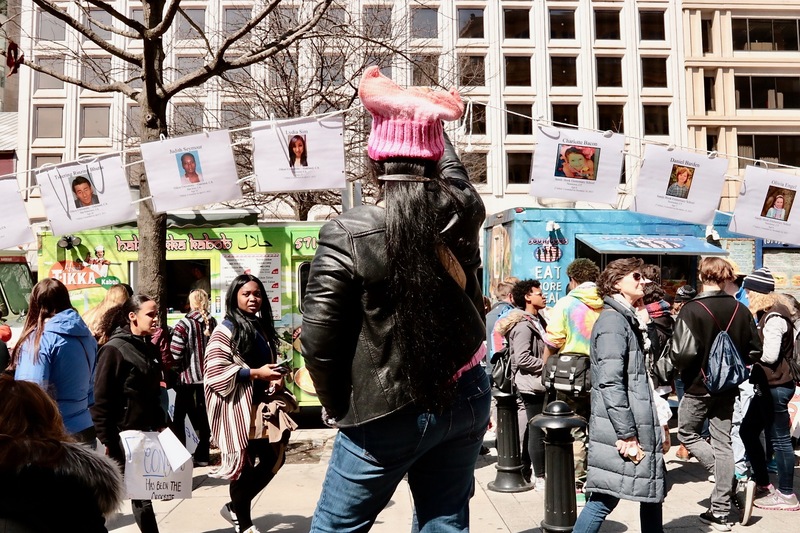 The Women’s March school-out movement has grown to include dozens of elementary schools, high schools, and colleges and universities across the nation who will take to the streets. 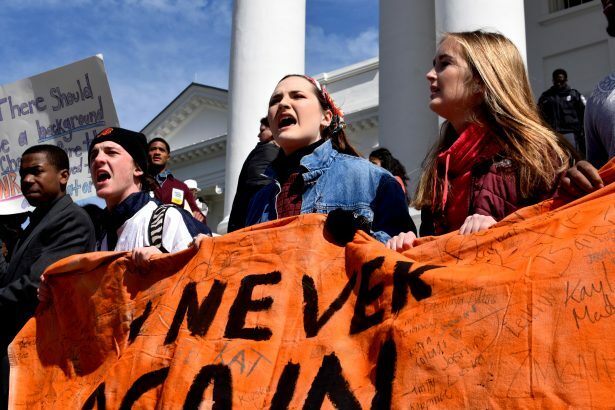 Kim Russell, Executive Adviser of Women’s March, is encouraging those who participate in walking out of class or just coming out in support of children and students, to wear orange in solidarity and support of victims of gun violence. By press time Monday morning, over 26,000 people said they were participating in the National School Walkout on the Women’s March event page another 97,000 are interested. 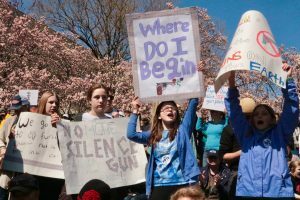 A little closer to home, children, and families of March For Our Lives will take to the streets of Washington, DC to protest gun violence on March 24. 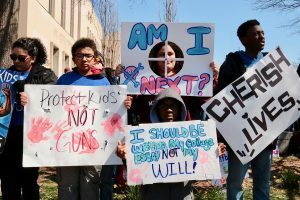 The group was organized by students across the country to demand politicians in Congress make their lives and safety a priority. The Richmond chapter of Women’s March is also willing to help facilitate the walkout by working with other students and organization that are demanding protection for children, teachers, and communities. Click here to add your event to the map of the walkout event or find one near you.